Technology is ubiquitous, and its potential to transform learning is immense. The first edition of Using Technology with Classroom Instruction That Works answered some vital questions about 21st century teaching and learning: What are the best ways to incorporate technology into the curriculum? What kinds of technology will best support particular learning tasks and objectives? How does a teacher ensure that technology use will enhance instruction rather than distract from it? This revised and updated second edition of that best-selling book provides fresh answers to these critical questions, taking into account the enormous technological advances that have occurred since the first edition was published, including the proliferation of social networks, mobile devices, and web-based multimedia tools. Each strategy-focused chapter features examples—across grade levels and subject areas, and drawn from real-life lesson plans and projects—of teachers integrating relevant technology in the classroom in ways that are engaging and inspiring to students. The authors also recommend dozens of word processing applications, spreadsheet generators, educational games, data collection tools, and online resources that can help make lessons more fun, more challenging, and—most of all—more effective. See the book's table of contents and read excerpts. 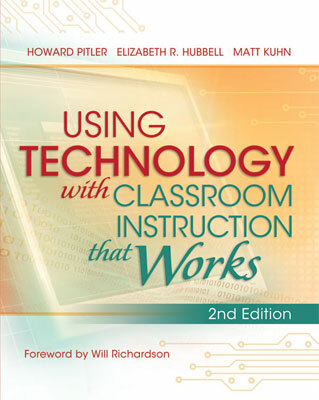 "[Using Technology with Classroom Instruction That Works 2nd Edition] is a 'big-picture' book that surveys the field of technological tools and helps the teacher connect with the kinds of technology she might wish to use in the classroom. Educators in the classroom up to district leaders, who are interested in what kinds of tools teachers and students can use with research-based instruction, will find this book quite useful." This review first appeared in The 21st Century Principal blog. "[Using Technology with Classroom Instruction that Works, 2nd Edition] does a great job at addressing how technology can be used across a variety of classroom settings. … It is a good jumping-off point for educators looking to use technology to support teaching and learning in their classrooms." —Mary Beth Hertz, technology teacher, Philadelphia, Pa. This review first appeared in the Philly Teacher blog. "The authors here are intent on showing and demonstrating how thoughtful technology planning by the teacher leads to classrooms full of engaged students who can dive deep into content-area exploration in a variety of genres, formats, and assessments. … [Readers] will find plenty of examples and strategies that can provide a nice road forward into using technology to plan instruction and also engage students in learning." —Kevin Hodgson, 6th grade teacher, Southampton, Mass. This review first appeared on Middleweb. "I was constantly tabbing pages of ideas that I then shared with a variety of teachers in our district. … This book is a great resource to get started with learning ways to integrate technology into the classroom with purpose." —Jessica Johnson, elementary principal, Juneau, Wisc. This review first appeared in the Reflections from an Elementary School Principal blog. HOWARD PITLER is a senior director at McREL. He conducts workshops and trainings for K–12 teachers and administrators on research-based instructional strategies, technology, and pedagogy, conducts technology audits for districts, and works with school and district leaders using Power Walkthrough classroom observation software. He holds an Ed.D. in Educational Administration from Wichita State University, an M.A. in Music Performance from Wichita State, and a B.A. in Music Education from Indiana State University. ELIZABETH R. HUBBELL is an educational technology consultant at McREL. She conducts workshops and training for K–12 teachers on research-based instructional strategies and technology integration, writes curriculum models for online classes, conducts technology audits for districts, and trains school and district leaders in using Power Walkthrough software. Prior to McREL, Elizabeth served as a building-level curriculum director and elementary teacher, where she focused on combining 21st Century learning environments with Montessori philosophies. MATT KUHN is a principal consultant in curriculum and instructional technology with McREL and a Google Certified Teacher. He conducts teacher professional development nationally in instructional technology, technology leadership, mathematics, and science. He has been published in several journals including Principal and Learning & Leading with Technology, and is also a coauthor of What We Know About Mathematics Teaching and Learning, 3rd Ed.